BetterPT - Progressive Physical Therapy, Inc. - Tarzana -- Progressive Physical Therapy, Inc.
Brian earned his Bachelor's degree in Health Science from California State University, Northridge in 1997 and his Master's degree in Physical Therapy the following year. Since that time Brian has worked extensively in outpatient Orthopaedic and Sports Medicine clinics. 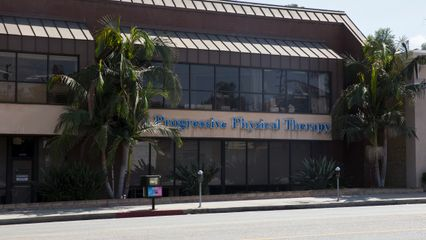 Brian is currently the Clinical Director of Progressive Physical Therapy-Tarzana. Over the course of his career Brian developed his skills in a variety of specialties not limited to care and recovery of sports injuries, post-operative care, chronic injury, spinal rehabilitation and re-training, balance dysfunction, and custom orthosis evaluation and fabrication. Brian has continued education and training in several technical areas including advanced joint mobilization, a variety of taping and support techniques, exercise and conditioning programs and injury prevention. Brian is a board certified Orthopaedic Clinical Specialist as well as a member of the American Physical Therapy Association and the American Academy of Orthopaedic Manual Therapists. He is also recognized by the National Academy of Sports Medicine (NASM) as a master trainer and provider of continuing education for private trainers. Jason graduated California State University, Long Beach in 2012 where he received a Bachelor's of Science in Kinesiology, with an emphasis in Exercise Science. Later, he earned his Doctorate in Physical Therapy from California State University, Northridge in 2015. Jason has a myriad of experience in outpatient orthopedics rehabilitation and prior experience working with other Progressive Physical Therapy clinics to hone his skills. Susan received her Bachelor of Science degree in Physical Therapy from California State University Northridge, Master of Science degree in Biokinesiology from University of Southern California (USC), as well as her Doctorate of Physical Therapy from University of Southern California. She is an Orthopedic Certified Specialist (OCS), a member of the America Physical Therapy Association (APTA), an APTA Certified Clinical Instructor (CCI), and a member of the Orthopedic and the Oncology Sections of the APTA. While working at UCLA she assisted in developing a TMD treatment program with the UCLA School of Dentistry and is recognized as an expert in the physical therapy evaluation and treatment of TMD. She has been a mentor for the USC Orthopedic Residency Program since 2010. In 2017, Susan chose to sell her practice and is pleased to be working with Progressive Physical Therapy. Theresa earned a Bachelor's of Science Degree from California State University, Northridge and her certificate in Physical Therapy from CSUN/UCLA in 1980. In 1995 she completed a Master of Orthopedic Manual Therapy degree from The Ola Grimsby Institute. She has over 35 years of experience. Theresa has numerous years of experience with various patient populations including college dancers and performing artists, recreational sports injuries, outpatient orthopedic spine and extremity injuries and general medicine. She has been a long time member of the American Physical Therapy Association, the American Academy of Orthopedic Manual Physical Therapists (AAOMPT) and the International Federation of Orthopedic Manual Physical Therapists (IFOMPT). Theresa enjoys volunteerism and she has been involved with Children's Hunger Fund, Operation Gratitude, sponsoring a child from Compassion International, serving at Oxnard Rescue Mission, trips to Russia and supporting ministries in Italy, France and England as well as ministry and involvement with orphans in Haiti. Amir graduated from University of California, San Diego in 2004 with BA degrees in Theatre and Dance, subsequently performing professionally on stage for several years afterwards. His background in dance allowed him to develop an interest and passion for physical therapy and the creativity of movement analysis, ultimately leading him to obtain his Doctorate in Physical Therapy from the University of Southern California in 2017. Amir is currently completing a residency in orthopedic physical therapy through USC, treating patients at Progressive, as well as teaching 1st year physical therapy students at USC, and developing research in the field of physical therapy for dancers and performing artists. Amir has clinical experience treating patients in a variety of settings, including out-patient orthopedics, sports rehabilitation, post-operative care, vestibular therapy, and neurological physical therapy, with an emphasis on treatment for Parkinson's Disease and post-CVA.